Color(s): black-and-tan and harlequin with patches of gray, black and tan. Coat: The hair is short with longer fringes on the tail and hindquarters. The outer coat should be harsh, never soft or silky, and should be lined with a wooly, fluffy undercoat - ensuring good thermal insulation. Distinct feature: The Beauceron is a brave, faithful and highly intelligent dog. Fearless, vigilant, and patient, the Beauceron has an aptitude for obedience training and is known for his quick and thorough understanding of his master's desires. They are an excellent natural guard dog whose appearance and demeanor command respect. 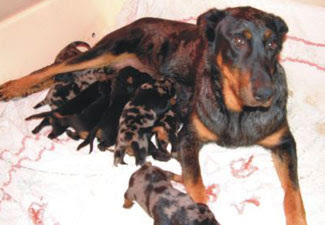 Temperament: The Beauceron is happiest when it is working or exercising in wide-open spaces. They are instinctive herders who will herd everything in sight unless trained to do otherwise. Calm, obedient and very loyal, the Beauceron is always eager to please its master. They like to know who is boss and then they follow. They are generally good with children if they are raised with them from puppyhood, although this large energetic breed can be overwhelming to a small child. The Beauceron will obey commands from all members of the family if trained to do so. This breed is sociable with dogs they know, but they are highly territorial and will not tolerate an intruder. They should not be left alone for long periods of time. Puppies are very active and slow to mature. Activity: The Beauceron will do okay in an apartment if it is sufficiently exercised. They are moderately active indoors and will do best with at least a large yard. Take it for regular long walks during which it can run free off the leash and play.